"Ewwwww! What's that for?" my husband said as I tried (unsuccessfully) to bury a tiny tin of anchovies into the bag of groceries I was packing for our family getaway to the mountains. "Don't worry about it," I said dismissively. But he wouldn't let up. "You're not cooking something with those, are you?" he said, his face contorted just like our three-year-old's when I try to serve her anything resembling a vegetable that's not a pea or a carrot. "You'll like it!" I yelled. I tend to get a little testy when people complain about food they haven't even tried...just ask my kids. Trust me, I don't like anchovies either. I'm not ordering them up on pizza or popping them in my mouth right out of the can. But in my adventures in cooking, I've learned that a teeny weeny bit of anchovy can add some yummy brininess to a dish without making it taste fishy. And when my husband finally tasted the end result: "Spaghetti with Anchovy Carbonara," he admitted he'd judged the little fishies too hastily. My four-year-old even declared it delicious and polished off her whole bowl! Spaghetti carbonara is one of those dishes that always pops up on "guilty pleasure" or "comfort food" shows." Traditionally it's made with pasta, bacon and lots of egg yolks and cheese, so it's pretty much a giant bowl of cholesterol problems waiting to happen. 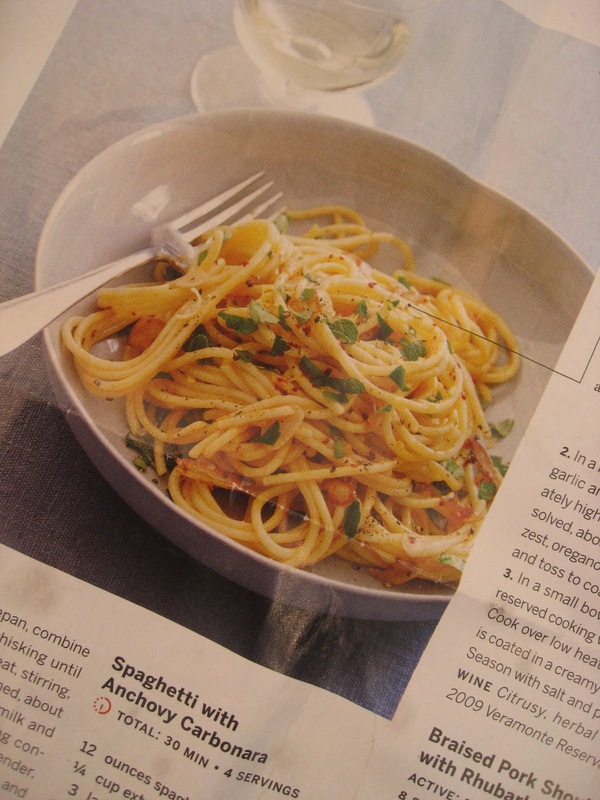 In a recent issue of Food & Wine magazine, I came across a recipe for carbonara that actually looked healthy, not to mention tasty and simple to prepare. I tore it out and took it along on my family's weekend in Flagstaff, where we were planning to spend our time snuggled up in front of a fire, cooking and eating a lot. I wanted to make something that would be comforting, warm, and filling. This fit the bill. The sauce is made up of some herbs, garlic, lemon zest, a few egg yolks, and - yes - some anchovies. But they dissolve! So you really can't even see them. And the best part was that it was done in under 30 minutes. Try it - you'll like it! If you like caesar salad, you'll like this pasta. If you don't, you're free to leave me nasty comments. **I recommend doubling the ingredients for the sauce. There was just enough to coat the pasta, but I definitely could have used more. 1. In a large pot of salted boiling water, cook the spaghetti until al dente. Drain the pasta reserving 1/2 cup (I say 1 cup) of the cooking water. 2. In a large, deep skillet, heat the oil with the garlic and anchovies and cook over moderately high heat until the anchovies have dissolved, about 2 minutes. Add the red pepper, zest, oregano and parsley, then add the pasta and toss to coat. Remove from heat. 3. In a small bowl, whisk the yolks with the reserved cooking water and add to the pasta. Cook over low heat, tossing until the pasta is coated in a creamy sauce, about 1 minute. Season with salt and pepper and serve. Guess why your husband disliked anchovies?? You are right.....me!!!! I very much disliked them, but am now willing to give a try. 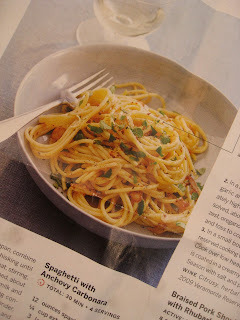 Never had spaghetti carbonara - don't you need the bacon?? ?